Even while the hopelessly dishonest, scientifically illiterate oldstream media continues lying to the public with the ridiculous narrative that “vaccines are safe” — read WashPost, The Atlantic, NYT or USA Today for a daily dose of vaccine holocaust denialism — the federal government has publicly released vaccine injury payout figures that prove vaccines routinely maim and kill children all across America. The government’s own document, found at this link, reveals statistics of over 18,000 petitions filed for compensation by families of children who were seriously injured, maimed or killed by vaccines in the United States alone. Podcast Transcript: “Alright, the US Government has now released the official vaccine payout numbers for fiscal year 2017 so far – obviously fiscal year 2017 is not over – but the government already paid out $159 Million Dollars to families whose children were vaccine-damaged. This is part of the function of the secretive vaccine injury court – it’s called the secret vaccine court – it was created I think in 1986 or 1988 at the same time vaccine companies were granted absolute immunity to all childhood vaccinations. I use to think that covered all vaccinations, but it’s only childhood immunizations, not adult vaccines. But the secret vaccine court sits higher than the US Supreme Court – really, higher than the Supreme Court – because a family tried to sue the vaccine company through the regular court system. The lawsuit went all the way to the Supreme Court, and the Supreme Court says they do not have jurisdiction. ‘Can you believe that?’ They don’t have jurisdiction. So, instead what you have to do, if you’re child is injured by a vaccines, which could be that they are killed, that they have horrible skin reactions, that they become paralyzed, – that’s very common – that they go into seizures, comas or even autism… any of these things, you have to hire an attorney and then once you have the attorney, you have to then partition the federal government – which of course has no incentive to give you anything – and then you have to wait anywhere from 2 – 10 years to receive a decision. And two thirds of the decisions are that the government says ‘ No, we’re not going to pay you anything’. US Govt. 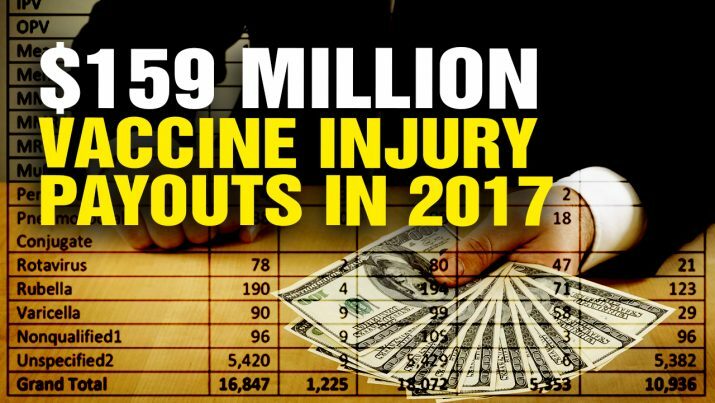 Releases Vaccine Injury Payout Figures from NaturalNews on Vimeo.